In the gardens of Playa Nicuesa we get a lot of visitors every day. Birds, reptiles, butterflies, spiders, frogs and mammals are attracted to our gardens due to the great amount of native plants with nectar and fruits they can find in here. Even though we do not support artificial feeding, animals stop by our place looking for food and shelter. Nicuesa's garden is part of their natural habitat. When you stay at Nicuesa, you will see a lot of animals walking around your cabin. One of the most common one is the White Nosed Coati (Nasua narica). You could find White Nosed Coatis (or Pizotes as we call them in Spanish) in the ground or in a tree during the day looking for food. They forage by keeping their nose close to the floor and sniffing around to find beetles, spiders, scorpions, ants, termites, worms, centipedes, and even land crabs. There is one Coati that is always hanging around in Nicuesa's garden. He is called ‘Toño'. We know it is a HE because usually male Coatis are solitary, while females travel in bands with other females and their babies. 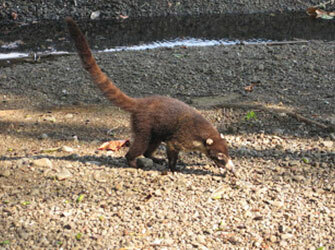 More than once we have found groups up to 25 coatis in our trails. They make this big groups as precaution against predators. Whenever the female Coatis come across ‘Toño', he follows them, disappearing for a couple of days from our garden… It is not only human nature to lose their mind for the ladies! Another mammal that you will probably find not too far from your cabin is the Central American Agouti (Dasyprocta punctata). 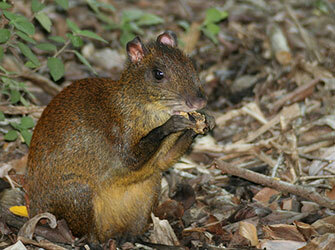 Agoutis are the biggest rodent from Costa Rica. Cherengas or Guatuzas, as known by the locals, feed on fruits and seeds mostly, but occasionally they will try fungi, insects and crabs. Agoutis are very cute when they eat. They feed sitting on their back legs, holding their food on their forepaws. Once they are full, they bury their food, which makes them an extremely important animal for regeneration of the forest, because they often forget where they hide their food, allowing the seeds to germinate and grow as trees. A less common animal that also visit our property is the Northern Tamandua or Anteater (Tamandua mexicana). Tamanduas are very intelligent. They are specialized to eat termites and ants. They know how to identify different castes in the termite society, so they will not eat soldiers of certain noxious termites, but will only eat the defenseless workers. Tamanduas have developed an aversion to leaf-cutter ants, army ants, and other ants that produce chemical defenses. They don't have any teeth but their tongue is coated with sticky saliva that catch the ants and termites. At night, Guatuzas, Pizotes and Tamanduas go to bed, but the Kinkajou (Potos flavus), also known as the honey bear, wakes up. The Kinkajou is nocturnal, arboreal and solitary. The Kinkajou, or Martilla as Costa Ricans call them, live in the canopy of the jungle, which makes them difficult (but not impossible) to spot during a night walk. They have an exceptionally long and narrow tongue that helps them to get their food: flowers, nectar, insects, and bird eggs. If you are ever sleeping at night in your cabin at Nicuesa and you hear a series high pitch short sounds, don't be scared, is just a Kinkajou calling. All of these animals and more you can find here in Playa Nicuesa. 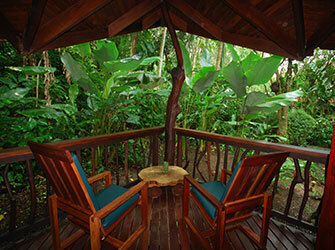 Don't worry if you hear steps or strange noises at night or during the day outside your cabin. The fauna that lives in here is always minding their own business: looking for food, for a partner, taking care of their offspring or just enjoying life in the Golfo Dulce jungle. 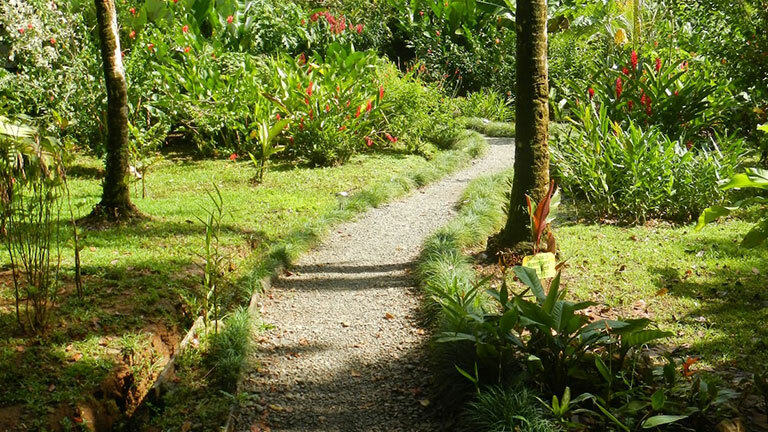 Thanks to our lush and biodiverse gardens, you may be lucky enough to see them all just sitting from your cabin's balcony.